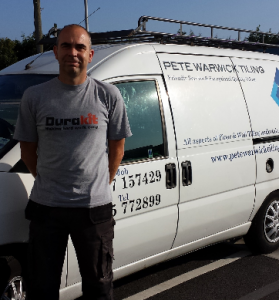 Pete Warwick has been tiling since 2004, a skill he perfected whilst working with a local kitchen & bathroom installation company. Pete now runs his own successful wall and floor tiling business and takes great pride in the work he carries out for his clients. Our customers have always been impressed by the exceptionally high quality of work Pete achieves and we continue to recommend him because of this. Pete thoroughly enjoys his work whether it’s a bathroom, kitchen, conservatory, wet-room, cloakroom or even victorian tiling. Pete has now completed two outstanding jobs for us and will definitely be coming back to do our new kitchen later this year. We have found him to be reliable, knowledgeable, easy to deal with and very trustworthy as we have left him in the house while we were both at work. We have no hesitation in recommending him as we know you will get an excellent job done. Really impressed and so pleased with Pete’s work. Very friendly and accommodating-always got back to us with our queries and was happy to come around and talk us through the different options prior to starting work. He also installed under heating and gave a high quality finish with the complex cuts for the more tricky areas that we had to work with. Could not recommend Pete anymore!! What Does Pete Say About New Image? I have been using New Image Tiles for over 5 years now. I recommend my customers to them to as they have a great selection of tiles, most of which are in stock. I use their own brand adhesive and grout because I know it works and it ensures a high quality and long lasting installation for my customers. When I need tiles or tile products ‘yesterday’ they do what they can to deliver at short notice. I would recommend New Image Tiles to retail and trade customers alike as they provide a friendly and professional service that I can depend on”. Over the last 25+ years, New Image Tiles, Kitchens and Bathrooms have made some strong bonds with local trades people and now have a team of recommended trades people that we use for all our commissioned contracts. 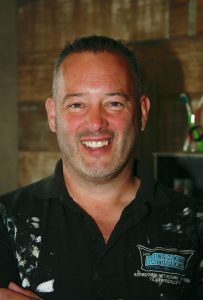 Gary Keegan is a qualified Carpenter & Joiner, mainly covering the Weymouth and Dorchester areas. Gary specialises in fitting kitchens and we have always recommended him to our customers because of his attention to detail. Kitchens can be expensive and stressful projects for people, which is why we are so particular with who we recommend to fit them. Gary has never let us or any of our clients down. His standard of work is excellent and we are often told what a pleasure he was to have around! I have been fitting kitchens for New Image for a few years now and in that time I have got to know their staff and their products really well. Their kitchens are a pleasure to fit because all the units are already assembled, and because they come with solid tops unlike most kitchens, customers have an useable worktop whilst they are waiting for their granite or quartz to be fitted which is really useful. It’s also really helpful that their kitchen units are manufactured in Dorset because, if for any reason there are any problems they can remedy within 24-48 hours unlike other kitchen companies. Over the last 25+ years, New Image Tiles, Kitchens and Bathrooms have made some strong bonds with local trades people. We now have a team of recommended trades people and approved bathroom installers that we use for all our commissioned contracts. Richmond Ceramics is a family run business with a reputation for quality and professionalism. They have a wealth of experience in the tiling industry. We have been recommending Jake and his team to our customers for tiling projects for many years. Our customers have always been delighted with the results, often making a special trip just to thank us for recommending him. We have no hesitation including him on our approved bathroom installers. ‘I’ve been using New Image for 20+ years for all my tiles and fixing materials and I now also recommend my customers to them for all their bathroom fittings. The sales team are always so helpful in offering advice and guidance to them and I like installing their products because they are high quality but not overpriced.